Free — For ticket information, please call the Box Office at (309) 694-5136. 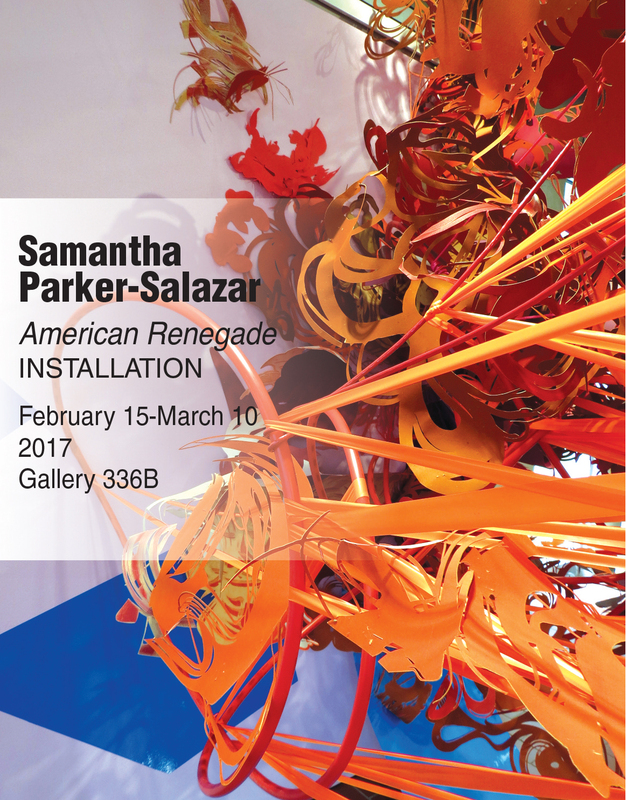 The installation by Parker-Salazar includes a bit of “family history,” as it is based on the life one of her ancestors, Cynthia Ann Parker. She was captured at the age of 11 by the Comanche in 1836 from Fort Parker, near what is now Waco, Texas. She was viewed by her contemporaries as an abused captive and later as a deserter or harlot. Unlike other tribes, the Comanche were not concerned with keeping written record of their history. As a result, the story of Cynthia Ann became a blend of folklore and residual judgment of a woman who seemingly rejected white society to live among Quahadi natives. In American Renegade, Parker-Salazar presents works on paper that, through their materiality, illustrate the same violence and fragility that consumed her ancestor’s life. Parker-Salazar earned her bachelor’s degree from Bradley University in 2001 and her master’s degree from the University of Texas at Austin in 2014. She was the 2014-15 John Fergus Post-MFA Fellow at The Ohio State University, where she also served as a lecturer in the printmaking area. Currently based in Columbus, Ohio, Salazar-Parker has taught workshops across the United States and has studied extensively in Europe. Her exhibition record includes national and international venues, as well as public and private collections. She has upcoming exhibits scheduled in Cleveland, Georgetown, Tex. and Veracruz, Mexico. *Please note that ICC is closed during holidays and breaks during the academic year; please call ahead to confirm the gallery is open.